Feature 2, a 3-meter diameter section of dark soil with the Survey’s excavation units laid out (facing north). The Arkansas Archeological Survey’s Henderson State University Research Station has been inventorying its collections with help from members of the Ouachita Chapter of the Arkansas Archeological Society. This process has uncovered many interesting assemblages, one of which is the material from Caddo Hills site (3MN22). In 1973, Ann Early, then station archeologist at the ARAS-HSU Research Station, carried out a weeklong salvage excavation at Caddo Hills. 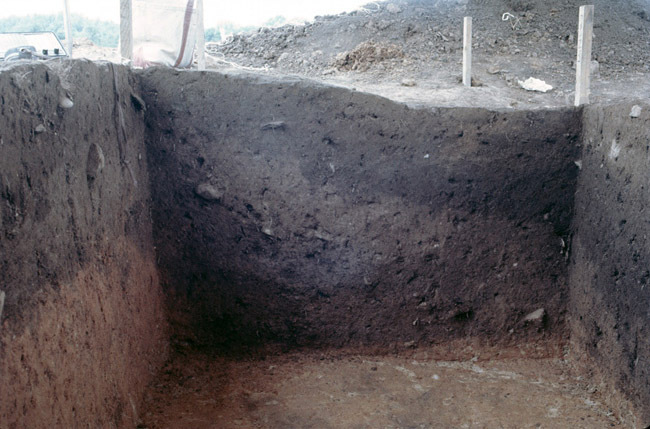 This project focused on the excavation of Feature 2, a largely undisturbed Native American pit. 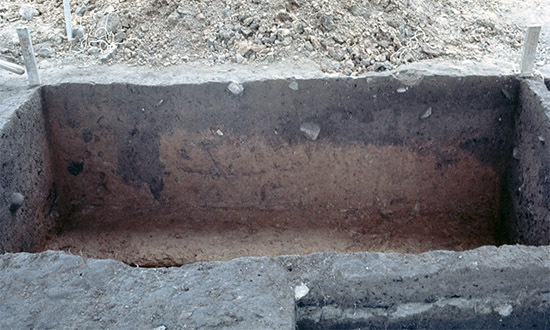 Excavations uncovered only the edge of the pit due to time and personnel constraints. Much of the pit was rich organic fill with chipped and ground stone, fire-cracked rock, ceramic, floral, and faunal material. Chelsea Cinotto analyzed the ceramic sherds to determine when the pit was filled as well as the purpose of the pit. 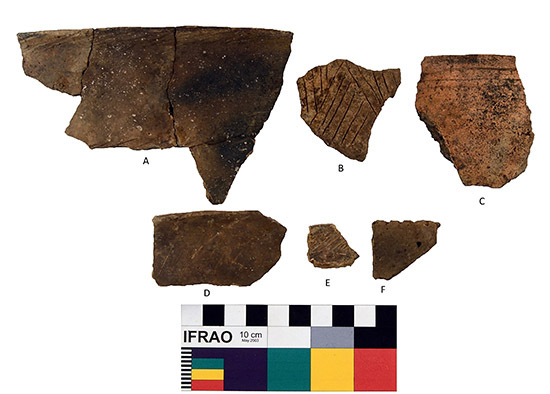 These ceramics were then compared with the ceramics found at other Caddo sites to see how Caddo Hills fits into the cultural landscape. Caddo Hills site sits on a terrace near the Caddo River in Montgomery County. In 1973, top soil was stripped off the terrace and spread around the area to level the land. Dr. Ann Early was called out to investigate the site disturbance. Intensive surface collection assembled a great deal of material, mostly chipped and ground stone artifacts and a single ceramic sherd, as well as a scatter of later historic material. Further surface removal revealed two features. The first was rectangular and filled with historic objects. This was interpreted as a hole previously dug by others and refilled with historic debris. The Survey’s focus for this excavation was Feature 2, a 3-meter wide circular area of dark soil. The top few centimeters included nineteenth-century artifacts, but beneath this, excavations uncovered an undisturbed 50 cm deep pit filled with Native American artifacts. Class A Braden Incised Jar Rim with pieces found in Feature 1 and Feature 2 Pit. 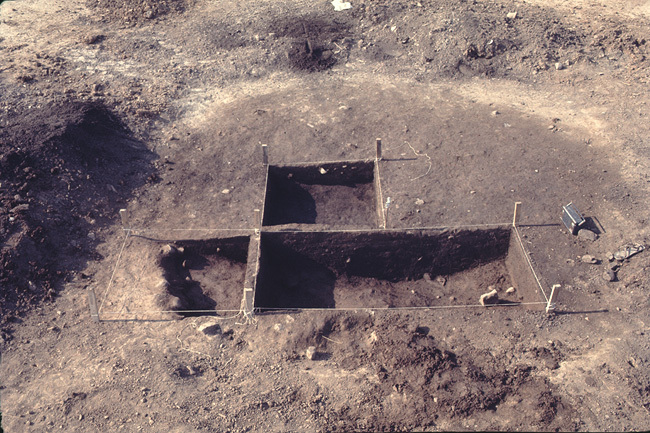 Feature 2 Unit 10:10 West Wall Pit Profile. Around 200 fragments of ceramics were recovered from the pit, none of which added up to a whole vessel. The largest find was a partial vessel reconstructed from sherds scattered through the pit and Feature 1. Most sherds were smaller than 10 cm in diameter. Sherds were mixed throughout all levels of the pit. Refitting sherds gives matches of ceramics that were found up to 30 cm apart in the pit. Ceramic density was high between 10 to 40 cm deep. There were few ceramics found deeper than 50 cm, which was close to the bottom of the pit fill and near the beginning of sterile soil. A possible post mold extended partway into the pit. No other post molds were discovered; however, the entire pit was not excavated. Only sherds larger than one-half inch were examined, giving a total of 216 sherds for analysis. Temper for each sherd was determined by looking at a fresh break along the edge using a microscope. The most common temper was mussel shell, sometimes mixed with very fine grit or with grog. There were smaller amounts of a few other temper mixtures. All tempers were found throughout all levels of the pit; there were no major changes in temper material from one level to the next. 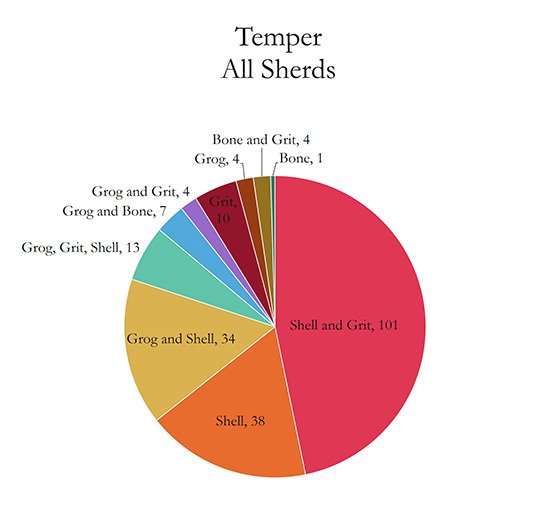 Mussel shell was the most common temper material, with 86% of the sherds containing shell along with other inclusions. 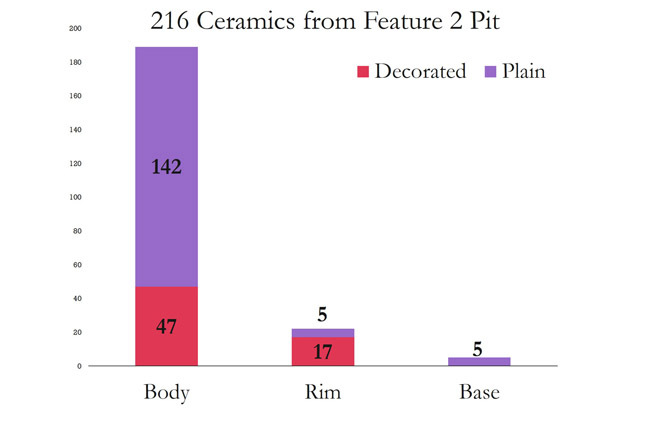 There were 216 ceramics analyzed from the pit, 30% of which were decorated rim or body sherds. The next part of the analysis was typing decorated sherds. Decorated sherds were sorted by the descriptive or “collegiate” system into classes. Class A decorations are rectilinear incised decorations arranged either vertically or diagonally. Class B decorations are also incised, but arranged horizontally or in a curvilinear fashion. The Class C decorations in this collection are punctated and punctated-incised. Class D is brushed. Class E is engraved decoration with burnishing. Incising was the most common decoration method, with a few examples of punctating and brushing, and only one body and one rim sherd that were engraved. The sherds typed by decoration were three Braden Incised rims, six Foster Trailed-Incised body and rim sherds, one Keno Trailed body sherd, and one Woodward Notched Rim. 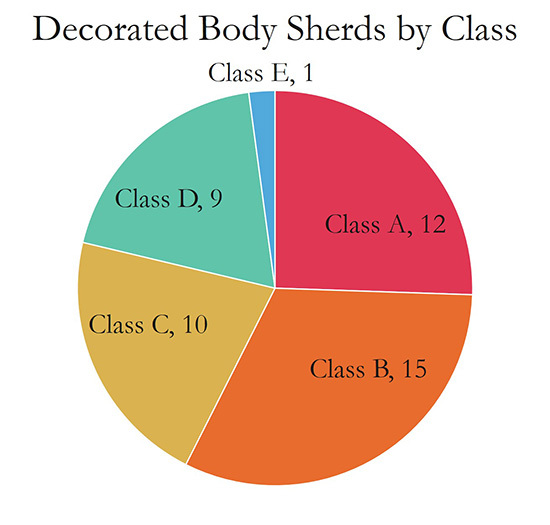 Two Woodward Plain bases were identified by shape and temper. Most of the decorated sherds were from utilitarian jars. There were a few fineware sherds, such as the Class E bottle sherd. The other fineware pieces were extremely lightly incised jar rims with a similar pattern to Foster Incised rims. 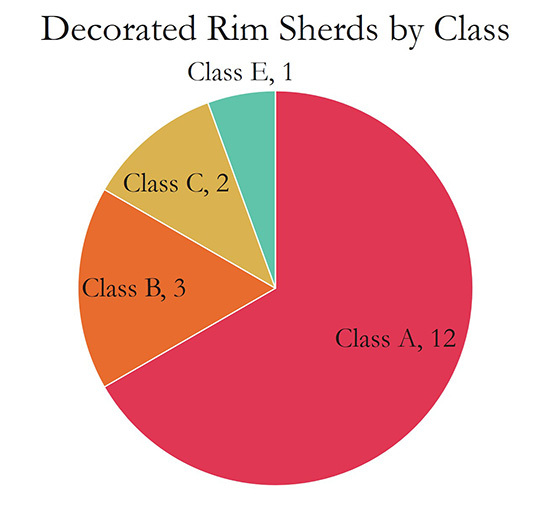 Decorated Body Sherds by Class and Decorated Rim Sherds by Class: Incising was the most common decoration type for both body and rim sherds. There were several punctated sherds and brushed sherds, and only one body and one rim sherd that were engraved. One possible post mold discovered along the south wall profile that extends partway into the pit. Feature 2 Unit 10:10 South Wall Pit Profile. The original purpose of the pit is still not clear. The post mold suggests there was a structure there at one time. What is more evident is that the pit was filled with midden material including previously broken ceramics. Refitting gives matches of sherds that were deposited up to 30 cm apart in depth as well as matching with some of the sherds from Feature 1. This suggests the pit was filled in a brief time period with trash that accumulated elsewhere prior to deposition in the pit. 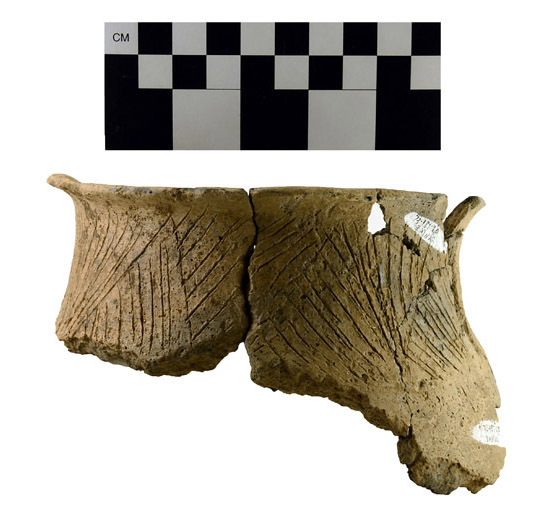 Based on the prevalence of shell-tempered sherds and the types of decorated sherds, the pit was filled with material from the Caddo period of the late AD 1400s to 1500s. 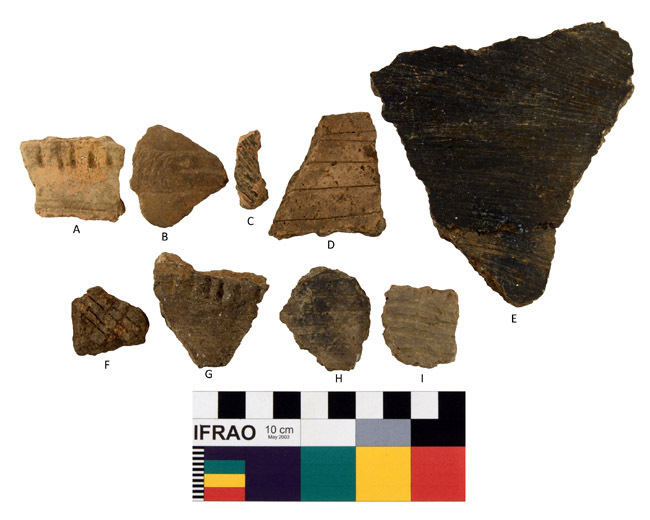 The decorated sherds have similarities with those found at the nearby Standridge site (3MN53), as well as with other Ouachita Mountains sites like Dragover (3MN298), Adair (3GA1), and Poole (3GA3). Further study may reveal more similarities between these sites, and how Caddo Hills was unique. Thanks to Dr. Ann Early and the other excavators of this site for their detailed records, which are curated with the artifacts at the Survey’s HSU Research Station. Thanks also to Ouachita Chapter members Florence Davis and Janice Fisher, who helped inventory this collection. A poster based on this research was presented at the 2017 Annual Meeting of the Arkansas Archeological Society. DeMaio Starr, Joanne 2017 The Adair Site: Caddo Relations through Ceramic Analysis. Caddo Archeology Journal 27:27–35. Early, Ann M. 1988 Standridge: Caddoan Settlement in a Mountain Environment. Research Series No. 29. Arkansas Archeological Survey, Fayetteville. Perttula, Timothy K. 2009 The Caddo Ceramics from the Dragover Site (3MN298) on the Ouachita River on Ouachita National Forest Lands in Montgomery County, Arkansas. The Arkansas Archeologist 48:1–14. Wood, W. Raymond and Ann M. Early 1981 The Poole Site, 3GA3. The Arkansas Archeologist 22:7–64.